Criminal cops and collusion as black as Whitey. — Steve Davis, brother of Victim Debra Davis. Documentary about the most notorious organized crime gang in South Boston in the mid-1970s – the FBI. Oh, and James “Whitey” Bulger’s peripheral involvement with them. WHITEY: UNITED STATES OF AMERICA V. JAMES J. BULGER is a comprehensive look at James Bulger’s rise to power as kingpin of South Boston’s Irish mafia in the 1970s, and how he retained that position throughout the 1980s by making devil’s deals with the FBI, through to his 2013 court case. Director Joe Berlinger (METALLICA: SOME KIND OF MONSTER, 2004) covers as many bases as he can, interviewing relatives of Bulger’s victims, extortion victims, attorneys for the prosecution, Bulger’s defense attorneys, and Boston police who worked on the Bulger case, giving all equal time. Only the FBI declined to be interviewed. Of course. Because anything you say can AND WILL be used against you in a court of law. All the evidence and firsthand reports lead back to them. They are implicated in Bulger’s crimes as heavily as Bulger is. To clarify: Bulger is not innocent of wrongdoing. He is a sociopath whose life revolved around crime, but there was a United States organization that was enabling him, that is therefore responsible for much higher crimes, that used Bulger as a scapegoat when his usefulness was spent. 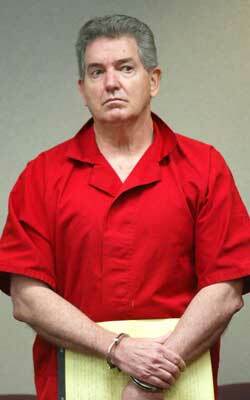 In April 2011, Whitey Bulger was “caught” after being on the lam for 16 years. Caught? Don’t you mean: the FBI had grown independent enough of their symbiotic relationship that they could afford to throw him under the bus? 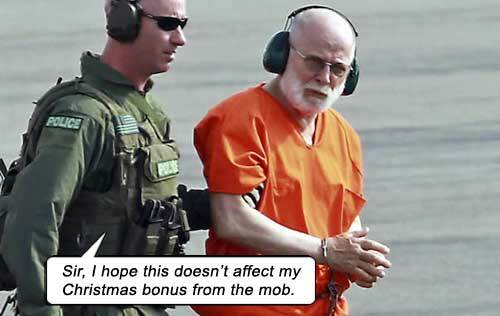 Bulger tells his attorney how he systematically used to pay off all the cops in Boston, the ATF, Massachusetts State police and the FBI, “Christmas is for kids and cops.” (So among other reasons for “catching” him, I’d wager the payments must have stopped as well…) Upon catching Bulger, the FBI crow about him as the “most notorious criminal in the history of South Boston.” How come we only hear about this “most notorious criminal” after the fact? Could it be because they’re trying to pad their glory? The FBI – at this very moment ­- are continuing to commit those same crimes they were perpetrating with Bulger. With some other unknown sucker! Don’t worry, citizens, we’ll hear about this patsy in 20 years when he too is “caught” and called the “most notorious criminal in the history of South Boston.” Does anyone doubt this?! The FBI has NO INTENTION of curbing its methods. We all know this! In one anecdote, we hear, “The FBI in Boston lied to the FBI in Oklahoma that Whitey had an alibi.” So if all the arrows continually point to the puppet master, why is the puppet being vilified? Whitey was just the triggerman. Why all this fuss over the foot soldier carrying out the orders and not the captain that was giving them? To be fair, even Whitey himself admits that he turned the tables on his FBI vultures, and ended up giving them the orders. Being implicated, the FBI stand by their claim that Whitey was an “informant.” A rat. Which Whitey hotly denies. He is intent on making his case that the federal government is more corrupt than the American people can imagine. Hey man, you had me at hello. His “informant” status is belabored in this documentary and an attorney explains why: because if it is proved Whitey was NOT an informant, then all those attorneys that built their careers on his supposed information, and all those cases that convicted mobsters, would be thrown out and the government could be sued for them. The new movie starring Johnny Depp as Bulger, BLACK MASS (2015), says unequivocally that Bulger was an informant. Of course it does. It’s a gutless Hollywood movie that doesn’t want to offend a federal law enforcement agency. Everyone is corruptible. There’s always a way to corrupt somebody. They’ve just got a badge that says Special Agent. There’s nothing special about them. They’re just people. — Kevin Weeks, Bulger associate. Viewing WHITEY, the one overarching “truth” about Bulger’s case is that there is NO overarching truth. Everyone’s got a different take on right and wrong, truth and lies, stings and cover-ups, and the meaning of “informant.” Bulger’s lawyers say one thing, the government says another. Who’s lying? Well, they BOTH are. How can the government claim to be innocent bystanders in this case if they tout him as the “worst criminal in the history…” and yet took decades to capture him even though it was officially on record that they were working with him? It means either he wasn’t committing crimes OR they were turning the other way. Now they just told us Bulger was constantly involved in criminal activity, outlining it in graphic detail, terrorizing, extorting and murdering people. So if they knew that then, what’s their excuse? Corrupt FBI agent John Connolly; in other words, Regular FBI Agent. Corrupt, disgraced FBI agent John Morris; in other words, average run-of-the-mill FBI Agent. John Connolly is their excuse. And their bumboy scapegoat. 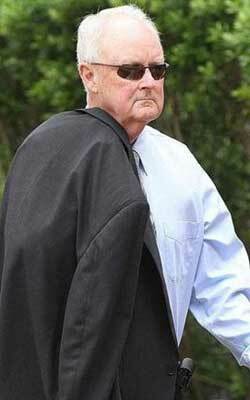 He was the FBI agent that made the deals with Bulger, shielding him from FBI prosecution. He’s doing time now. Yet every other victim, attorney and Boston cop affiliated with this Bulger case cites numerous FBI agents and the Bureau’s methodology itself for enabling Bulger. Fat chance anyone else will see jail time. (Bob Fitzpatrick, an FBI agent who tried to make headway on arresting Bulger, tells us how he was continually blocked by higher-ups.) It’s like the collective corporate pigs at AIG destroying the U.S. economy, getting bailed out, and then sending ONE PERSON to jail for it. Connolly’s superior, John Morris, was also in on the gag, but somehow this “moral coward” walks the streets a free man. Stephen Rakes, one of Bulger’s extortion victims, commands a lot of screentime – until he’s found dead! During the making of this doc! He kept telling friend Steve Davis (brother of a Bulger victim, Debra Davis), he was waiting for his day in court, that he had information tying Bulger to the federal government, “You’ll see how high up this goes!” Rakes would never get the chance to speak. You’d think that Bulger’s younger brother, William “Billy” Bulger, being a former president of the Massachusetts Senate, could have pulled some strings, but I’m presuming he no longer had the clout. In 2013, Billy was near 80, Whitey was over 83. Starring: Johnny Depp, Joel Edgerton, Benedict Cumberbatch, Dakota Johnson, Kevin Bacon, Peter Sarsgaard, Jesse Plemons, Rory Cochrane, David Harbour,, Adam Scott, Corey Stoll, Julianne Nicholson, W. Earl Brown, Bill Camp, Juno Temple.